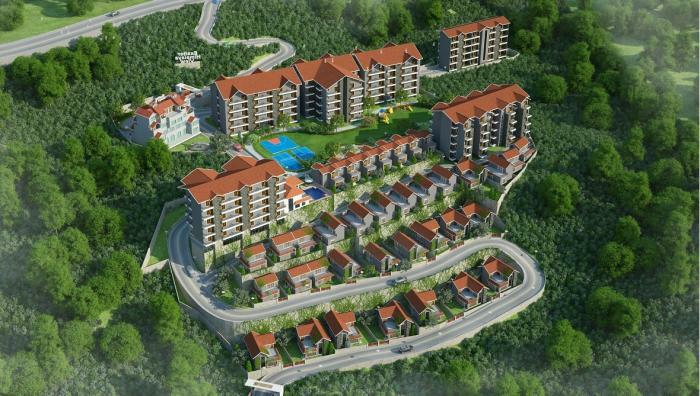 Exalter Himalaya View is located in Nainital and comprises of thoughtfully built Residential Apartments. The project offers easy access to premium and basic facilities such as hospitals, schools, colleges, medical centers, grocery stores, eateries, malls and supermarts etc. Location Advantages:. Exalter Himalaya View is located at a prime location of Majkhali such that it provides easy connectivity through wide roads to all other major parts of the city, Nainital. The complete address of Exalter Himalaya View is Ranikhet, Majkhali, Nainital, Uttaranchal, INDIA.. Builder Information:. Exalter Group, a leading group in real-estate market in Nainital, built these unique set of Apartments named Exalter Himalaya View. This builder group has earned its name and fame because of timely delivery of world class Residential Apartments and quality of material used according to the demands of the customers. Units and interiors:. Exalter Himalaya View offers 1 BHK, 2 BHK and 3 BHK Apartments with different floor plans. The dimensions of area included in this property vary from 451- 1800 square feet each. Exalter Himalaya View is spread over an area of 5.00 acres with many floors. Exalter Himalaya View is designed in such a way that these Apartments comprises of enough wide space for an organized home with proper ventilation in each room. The interiors are beautifully crafted with all modern and trendy fittings which give these Apartments, a contemporary look. Comforts and Amenities:. The amenities offered in Exalter Himalaya View are Intercom, Cafeteria, Gated community, 24Hr Backup Electricity, Rain Water Harvesting, Cafeteria, Security and Wifi. Construction and Availability Status:. Exalter Himalaya View is currently ongoing project. For more details, you can also go through updated photo galleries, floor plans, latest offers, street videos, construction videos, reviews and locality info for better understanding of the project. Exalter Group is a well-known player in real estate industry, and their focus from day one has been to provide the best quality real estate products. Apart from that, they provide the best customer service and the uncompromising values. It has till now handed over 3 projects across housing projects and is working on approximately 1 societies in the city. The company's main goal is to provide the best real estate services in all the areas they serve. Exalter Group is a result of an entrepreneurial vision that started the saga in the demesne of real estate by providing independent and builder house site to people at affordable prices in entire National Capital Region and North India. Exalter Group is just another tale of this successful saga. The passion, fortitude and commitment towards supremacy have taken the Group so far. Today, the Group is catering the needs of all genres by building commercial and residential buildings. Review of Exalter Himalaya View, Majkhali? Its price, location, builder etc. Review of Exalter Group, Majkhali? construction quality, trustworthy, delivery history etc.? Review of Exalter Himalaya View, Majkhali location? neighbourhood, connectivity, schools etc.? Comparison of Exalter Himalaya View, Majkhali to nearby projects? Is it rightly priced? What is your feedback on this Exalter Himalaya View, Majkhali? Depends on brand name and complete the project in time etc? Will this be a better option for investment or to live in Exalter Himalaya View, Majkhali? Can you give some suggestion? Is the Exalter Himalaya View, Majkhali has more potential in terms of capital appreciation, ROI, Rentals, Proximity to social infrastructure etc?